On the morning of March 22, 2006, NASA launched their Space Technology 5 mission. For about three months, miniaturized satellites explored Earth’s magnetic fields collecting high-quality measurements. Beyond gathering scientific data, the mission represents a turning point. Instead of large traditional satellite missions, miniaturized technology is taking precedence in space exploration. And within these systems, MEMS technology could serve as a means of active thermal control. Further improvements are already taking shape with the help of multiphysics simulation. The trend of miniaturization is one that we can see in a variety of applications, including mobile phones and computers. The same can be said for the design of satellites used in space missions. The devices used in NASA’s Space Technology 5 (ST5) mission are just one example. 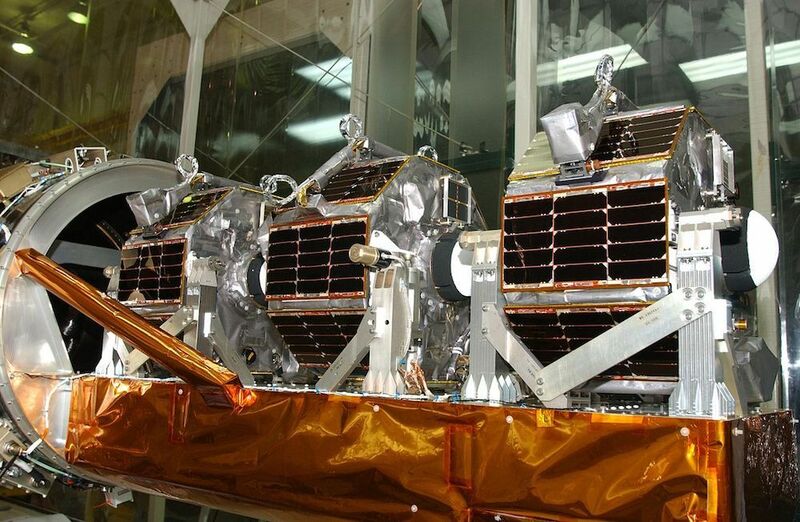 Microsatellites mounted on a payload structure for the ST5 mission. Image by NASA. Licensed under the public domain, via Wikimedia Commons. Due to the payload complexity of microsatellites — and the desire to extend their reach outside of Earth’s orbit — active thermal control is very important. Such control demands more power and also increases the mass of the satellite with added parts. The challenge is to design a thermal control system that can meet these power and mass demands while still removing excess heat in a controlled manner. With this in mind, NASA used electrostatic comb drives for actuation in their ST5 mission. These actuation systems were paired with two different radiator designs: a louvre and a shutter configuration. The mission helped to validate the use of high-voltage MEMS technology in thermal subsystems. Left: The shutter concept. 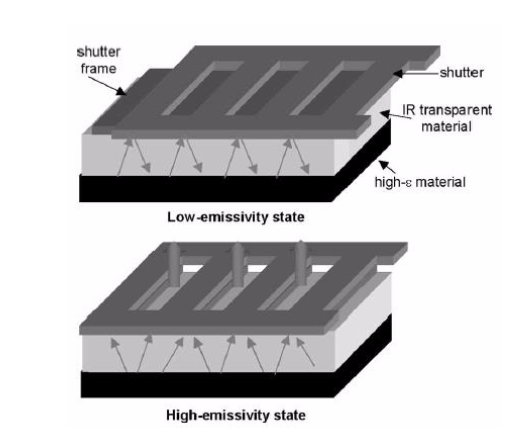 Right: An optical microscope image of the shutter radiator design. Images by L. Pasqualetto Cassinis and taken from his COMSOL Conference 2016 Munich paper. Looking to build upon these initial findings, a researcher from TU Delft considered an alternative to using electrostatic comb drives: thermal actuators. These devices provide relatively high displacement with little applied voltage and are less sensitive to radiation than their electrostatic counterparts. To validate their potential in such applications and further optimize their design, the researcher turned to the COMSOL Multiphysics® software. 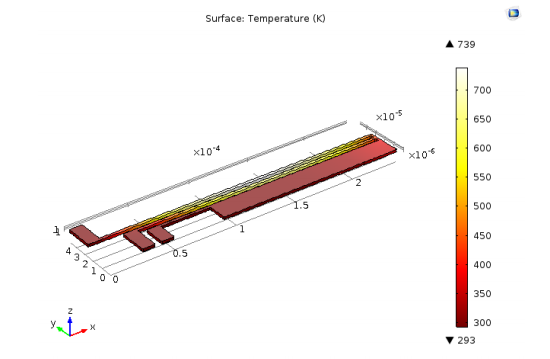 For this analysis, two models were built in COMSOL Multiphysics. The first is a 3D structural model of the shutter array, a configuration chosen based on its robustness. 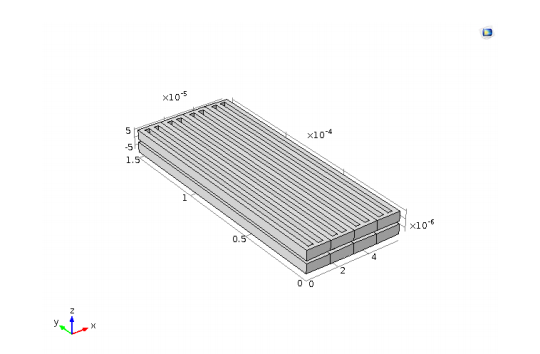 3D shutter array model. Image by L. Pasqualetto Cassinis and taken from his COMSOL Conference 2016 Munich presentation. The second is a 3D multiphysics model of a two-arm thermal actuator made of polysilicon — a model based on the Joule Heating of a Microactuator tutorial. An applied voltage generates electric current through the two hot arms, raising the temperature of the actuator. This temperature increase leads to thermal expansion, which then causes the actuator to bend. In addition to these hot arms, the thermal actuator includes a cold arm, with a gap that separates the two types. Note that the hot arms have more electrical resistance than the cold arm, thus greater Joule heating. Thermal actuator model geometry. 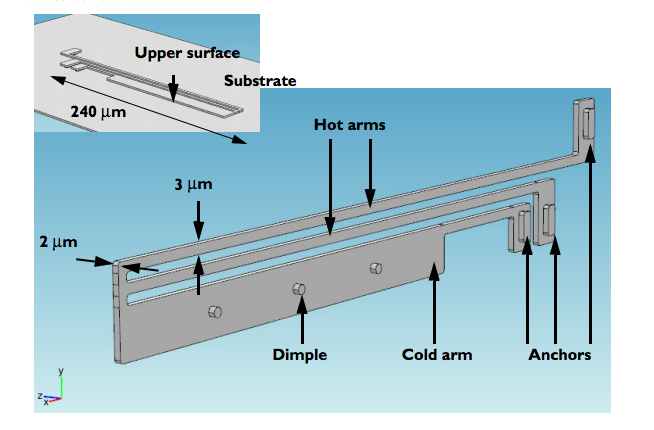 This image is taken from the documentation for the Joule Heating of a Microactuator tutorial. To validate the thermal actuator model, the researcher compared the simulation results with analytical results and checked if the output displacement was close to the requirement of 3 µm. In the model, the displacement is 2.54 µm — a value comparable to that of analytical results (2.11 µm) and also near the required displacement. Note that the theoretical model only includes one hot arm, which can account for some of the differences in displacement values. Further, the simulation shows agreement in regard to temperature distribution, with the highest temperature at the center of the actuator. A spring-like force is added to the shutter model to account for stiffness. With varying forces applied to the device, the shutter exhibits elastic behavior. The estimated stiffness obtained via the study is incorporated into the thermal actuator model. When varying the voltage to evaluate tip displacement via actuation, high voltages are needed to produce reasonable displacement. Additionally, as expected, the maximum displacement occurs at the center of the actuator instead of the tip. After verifying the thermal actuator model, the researcher sought to optimize its configuration. In this optimization study, the length of the actuator is varied along with the gap between the hot arms and the cold arm. Per analytical results, both variables are assumed to have a strong impact on tip displacement. In the initial optimization study, an applied voltage of 2.7 V produces a shutter stiffness of 109 N/m3 and a displacement of 2.98 µm. Additionally, the maximum temperature that the device reaches is significantly lower than the melting temperature of silicon. The displacement (left) and temperature (right) of the thermal actuator with an applied voltage of 2.7 V. Images by L. Pasqualetto Cassinis and taken from his COMSOL Conference 2016 Munich presentation. Reducing the required applied voltage was the focus of a later optimization study. Just a few volts can be crucial in, for instance, applications of CubeSats — a type of miniaturized satellite used for space research — where power demand is limited. For this study, multiple objective variables are considered and the gap between arms is included as a control variable. 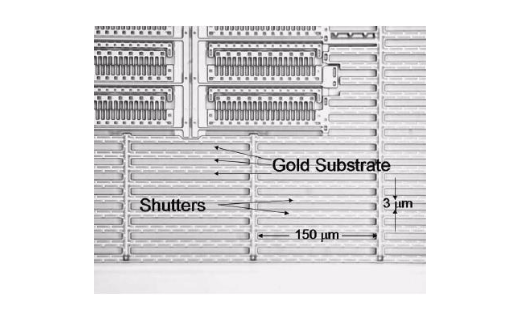 With this approach, the displacement comes closer to 3 µm and the applied voltage is reduced to about 2.5 V.
Advancing the design of miniaturized satellites is key to extending their use in space exploration. 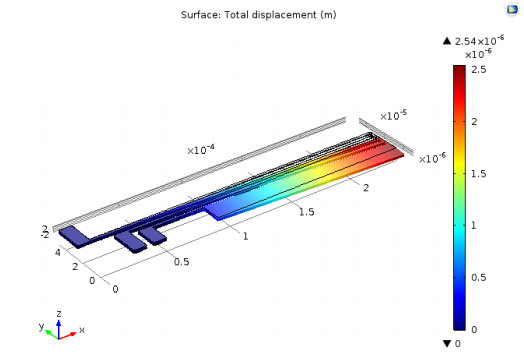 As we’ve highlighted with this thermal actuator example, simulation is a useful tool for testing active thermal control techniques in these systems, improving their safety and reach. We look forward to seeing how this technology will continue to advance in the future and the potential role that simulation will play.